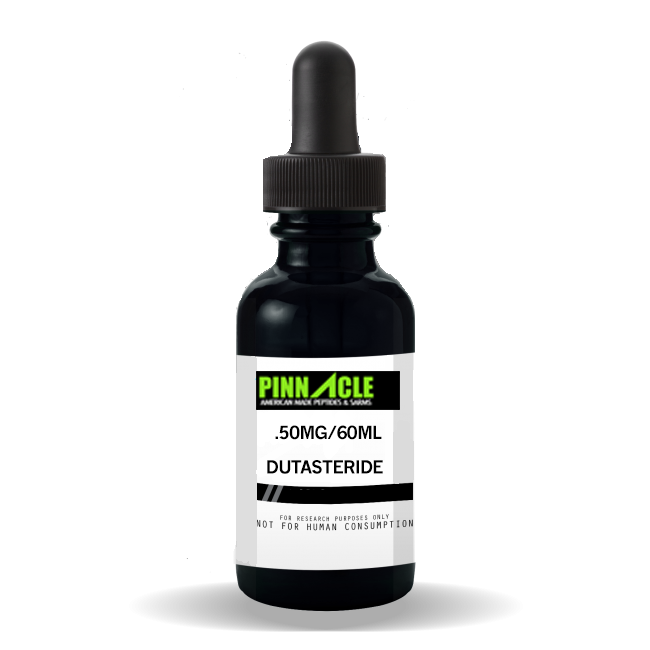 DUTASTERIDE is highly popular among body builders. This peptide belongs to the class of chemicals which is known to scientists as a 5-AR inhibitor. The AR stands for alpha reductase. This enzyme in particular is useful for converting the chemical testosterone into a much more active androgen, DHT. It is mostly used by physicians by oral methods as treatment for enlarged prostates. It essentially reduces the size of the enlarged prostate. However these peptides are for the extensive use of research only. Pinnacle Peptides provide you this product in small bottles for your usage. You can avail any amount of this product from the online store. In case you have a research work to accomplish through these peptides, you can just select the amount of chemical you want to purchase and place your order. Deliveries are shipped to international markets as well. So when you are looking for pure quality peptides, Pinnacle Peptides is your one stop shop. Duasteride is a peptide which needs further research upon it. Depend on Pinnacle Peptides for all your research peptide supplies. DUTASTERIDE is also called Avodart in the market. Duasteride exhibits the isoforms of 5-alpha reductase of both type I and type II while Finasteride exhibits the isoforms of only Type II. Some research was undertaken with Duasteride in late 2002 to study whether they had any effect on hair growth in patients. However that experiment had been called off according to news. Whether or not they are beneficial in hair growth remains a mystery to us, and is for the scientists to unravel. This is why they are required in labs for further investigation about their effects. Some research has also contributed to the study that DUASTERIDE may be helpful in reducing the chances of prostate cancer. If you are looking for this peptide and other best lab supplies in the industry, then look no further. You have found your one stop shopping place where you can get all your lab supplies from. So buy our products availed at unbeatable prices and get to know their pure quality only at Pinnacle Peptides. The products we offer are intended for laboratory research use only. In purchasing any of these items, the customer acknowledges that there are risks involved with consumption or distribution of these products. These chemicals are NOT intended to use as food additives, drugs, cosmetics, household chemicals or other inappropriate applications. The listing of a material on this site does not constitute a license to its use in infringement of any patent. All of the products will be handled only by qualified and properly trained professionals. All customers represent and warrant that through their own review and study that they are fully aware and knowledgeable about the following: Government regulations regarding the use of and exposure to all products. The health and safety hazards associated with the handling of the products they purchase. The necessity of adequately warning of the health and safety hazards associated with any products. Pinnacle Peptides and www.pinnaclepeptides.com reserves the right to limit and/or deny sales of products to any unqualified individuals if we have reason to believe that misuse will occur.